Will loves to bake and especially to decorate cookies, so we finally got around to making gingerbread men this weekend. I used this recipe and it was awesome. They taste so good and the dough was nice to work worth. They held up well to being handled by kids, but weren't so hard they break your teeth. I used butter cream frosting because I know royal icing makes pretty cookies, but I also think it tastes horrible. The butter cream and gingerbread was amazing, everyone that sampled said "I don't even like gingerbread, but these are so good I could eat the whole tray!" Unfortunately, Bettis (our labrador) beat them to it. Yep, he ate the whole tray, more than two dozen men, while I put the boys to bed Saturday night. I. Was. So. Pissed. I made another batch Monday ,for a cookie exchange yesterday. On the right is the first one Will decorated (Jack was too darn busy with Legos to join in). He made vampire teeth with some of the decorative candies I had out. I realized how good the butter cream frosting + gingerbread combo was by this point, so I made a cookie just to eat with as much frosting as possible. I realized he looked like a mummy. So we went a little ghastly for gingerbread. All those lovely little gingerbread men in the first picture had a mummy makeover. Luckily my parents got a plateful before Bettis got them. The Gingerbread Mummies were definitely a hit. Now I have to remember to make them for Halloween next year! There has been some sewing going on here too. Last night I took one of these house ornaments, from the Retro Mama Tutorial, to our swap and holiday party for Charlotte Modern Quilt Guild. I got this awesome bird from Diane. It was so nice to see all my quilty friends! 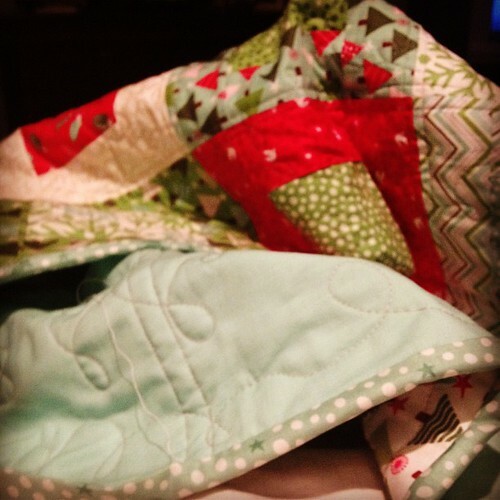 When I got home I finished the binding on my parents' Christmas Quilt. It took until almost midnight, but it is in the dryer now and ready to give to my parents as soon as it comes out. I'll have the full reveal tomorrow! I think I really like this one. OMG...will have to remember that with our Zoey...she ate my meatloaf this summer. You have amazing energy. Guess I would have to give up 30 years to be like you..sigh..not happening...and you got my lumpy bird!!! We had a nice time last night. Oh my, I bet that was one happy and full doggie. Thanks for the ornament! I LOVE it and it is hanging happily on my tree. You always do such beautiful work. happy holidays! 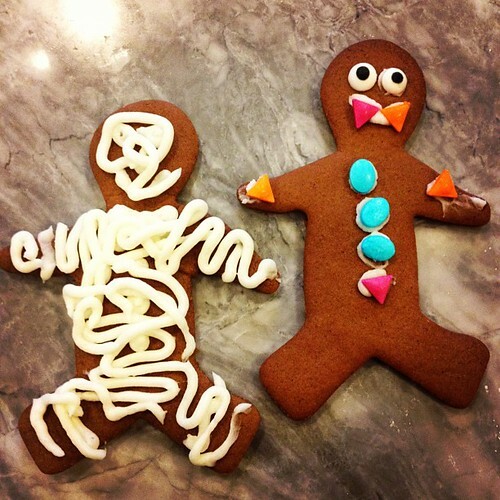 i love the mummy gingerbread men. 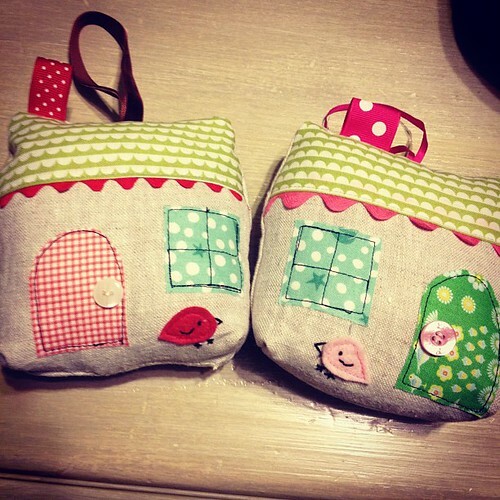 And I just made a house ornament today too-- aren't they so cute!? Hahaha, the bad dog! Funny time. I would have been annoyed too. I'm making ginger bread tomorrow with my 9yo daughter, but I bet my 6yo son will be more dedicated. He just loves to bake with me, or my mum his Nanny.